Cue Connect, the company unifying shoppers and retailers for better commerce, today announced results from its new research, Consumer Moments of Truth, which provides retailers with a glimpse into the inner most workings of the millennial shopper’s minds. (Graphic: Business Wire). NEW YORK--(BUSINESS WIRE)--In the second sentence under the heading, "The Elite Shopper: Prefers Things Handed to them on a Silver Spoon," please replace "costumer" with "customer." Please also replace "co-founder" with "founder" in the fourth paragraph, third sentence. Cue Connect, the company unifying shoppers and retailers for better commerce, today announced results from its new research, Consumer Moments of Truth, which provides retailers with a glimpse into the inner most workings of the millennial shopper’s minds. Millennials represent over 80 million shoppers, with a current shopping habit of almost $600 billion and an estimated growth to over $1.4 trillion by 2020, according to Accenture. With this survey, Cue Connect provides deep insight into, and understanding of, what’s really going on in the minds of the fastest growing category of shoppers the world has ever seen, or what we’re calling “the truth.” The result? Surprising at times. 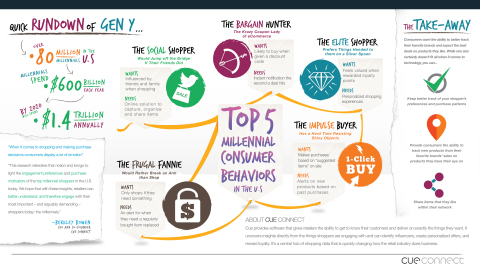 Cue Connect has identified the top five millennial shopping personas and the expectations and behaviors associated with each. What motivates them at point of purchase? How do you create brand loyalty with each persona? What tools are currently missing in the e-commerce space that can help retailers win their share of the $1.4 trillion pot that’s up for grabs? Nearly 50% of consumers are either somewhat or very much influenced by friends and family when making a purchasing decision. How are retailers tracking social interactions and making marketing decisions based on this? 47.6% of respondents claimed that they feel most valued by retailers who reward them with loyalty points. Are you customizing your loyalty strategy to custom fit the aspirations of your customer? Almost 50% of respondents have made a purchase based on the “suggested items” option on a retailer’s site. Are you smart enough to suggest items that will convert to a sale? Can you automate custom suggestions? 37.2% of respondents claimed that they’re motivated to shop only when they absolutely need something. Have you built enough loyalty to make sure these customers buy it from you? Do you know where to start? Cue Connect’s research answers all of these questions and more. Whether it’s the Bargain Hunter or the Elite Shopper, the ability to better track and therefore serve your customer and offer a brick and mortar experience online is the future. One size doesn’t fit all, so when it comes to technology, retailers can implement solutions, such as a Wishlist and sharing tools to keep better track of their shopper’s preferences and purchase patterns. Meanwhile they are giving consumers the ability to track new products from their favorite brands, be the first to know about sales, or share items that they like within their network. To learn more about these personas and their top demands for retailers, please view the in-depth e-book, which can be found here: Consumer Moments of Truth. To learn more about Cue Connect and its online retail marketing platform, please visit: https://business.cueconnect.com/features. In a digital world that’s filled with infinite distractions, Cue Connect provides shoppers with focus, helping them build deeper relationships with retailers to enhance the shopping experience for everyone. The company’s online retail marketing platform, Cue, connects retailers to shoppers across the entire path to purchase. Through Cue, retailers gain new shopper intelligence and unlock unique insights from existing shopper behavior with the ability to share and save items. In doing so, retailers are empowered to build custom experiences and deliver relevant content at the point of sale, helping improve customer satisfaction, increase conversion rates, basket size and average order value. Cue is built to integrate into all available web, mobile web, and mobile app retail platforms with no engineering required. For more information, please visit: www.cueconnect.com.